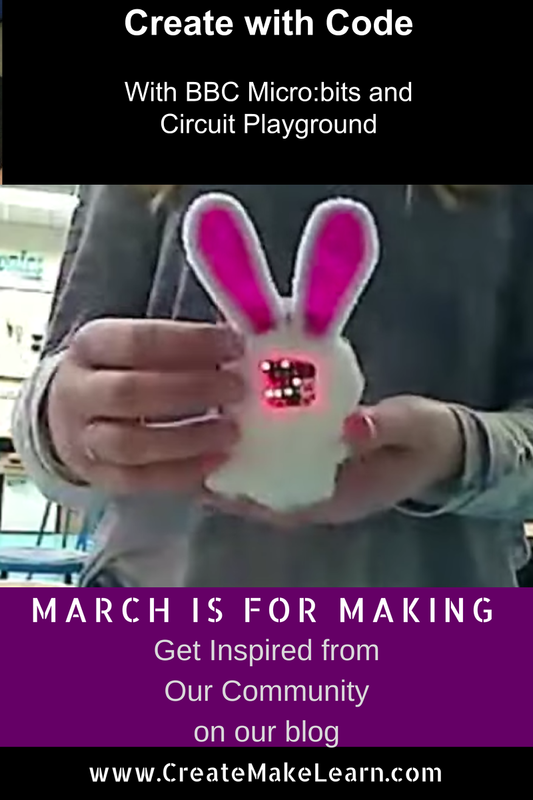 Today's post in the March is for Making series (30 posts in 30 days to inspire making in your school) features an amazing maker educators who will be back as an instructor for the 2018 Create Make Learn Summer Institute to lead a session on coding with Micro:bits. Thank you Leah @jolyleah for today's inspiration! During Vermont’s annual Hour of Code Guest Speaker Series this year we were inspired by a conversation between students from Williston Central School and professional hardware and software engineers at NRG systems as they shared their experiences in coding physical objects. To hear career professionals share that they wished they could have had this opportunity when they were in school validated the fact that these Leah Joly is helping students better understand the world around them and the type of skills needed to shape the design of their world in the future. During this Guest Speaker event, we learned that these middle school students can spot microprocessors all around them and explain how they work in everything from a Scoreboard at a sporting events to the Fitbit on their wrist. And that’s all because their teacher, Leah Joly @jolyleah has updated the Design and Technology program at Williston School to include Coding in the Curriculum and has the students CREATING, MAKING, and CODING physical objects that they design. Last year’s experience with Ms. Joly included learning to code with Scratch and creating game controllers using a Makey Makey. This experience provided a great foundation to this year’s projects where the students were introduced to the BBC: MicroBit and Adafruit Circuit Playground as processors that could be embedded in projects they designed. Their first project involved designing a pet for someone else using the different stages of design thinking. The students integrated a Microbit in their design and coded it to show emotion. The Micro:bit is a tiny programmable computer designed by The Micro:bit Educational Foundation to enabling children around the world to get creative with technology and gain digital skills in school, in clubs and at home. Williston students shared several inventions they created and coded using tools and materials in their classroom with the Microbits. Who couldn’t use a new wallet that keeps track of how much money is in your wallet. To imagine how this would work, check out this duct tape wallet prototype which allows you to press a key on the Microbit to add money to your wallet or shake it to get the total amount in your wallet. Inspired by the her brother’s FitBit, this student created a prototype of a new armband that monitors your steps each day. When you listen to this student describe how she coded the MicroBit’s accelerometer to count every time your arm titled and to monitor how long you are walking, you can’t help but wonder what type of inventions will come from this new generation of emerging engineers and coders. Another students shared how she used the microBit in a water bottle design where you could touched one button to add 8 oz and a different button to add 16 oz to her Water Bottle Counter. When she shakes her water bottle it will display a message to DRINK more Water if you have not consumed at least 50 oz today. This is not the type of coding that has students staring at code all day. Leah uses physical activities and unplugged coding events to have the students grasp a deeper understanding of sequence, variables, conditionals and other computer science concepts. They used their new skills with coding the MicroBit to design new versions of games such as Rock Paper Scissors or Ghost in the GraveYard. Not only do the projects teach the students to invent and code, they also require the students to problem solve and persevere through challenges. One student described how the challenges he’s working on now in trying to use a servo motor to send a signal to the Microbit so he can use it to score a marble game. He and other students often find themselves coming in during lunch and recess to work through their challenges or complete projects. For some students, coding the micro:Bits lead to an further exploration of coding with Circuit Playground by AdaFruit. They liked that the built in simulator lets you see the output of your code and tweak it before you put it on the device. On Monday, Eva started to code ‘Ode to Joy’ as the light changed on her project. Programming each note individually was time consuming, but really helped her understand how code drives everything from a musical Christmas light to electronic doorbells. Rob and Andrea particularly liked how the projects all tied back to the fundamental principles of computer science from variables to conditionals. Their questions to our young makers were a perfect transition to the last part of our virtual guest speaker event for the day where Rob and Andrea from NRG systems shared how coding is used to code both software and hardware in thier company and the path they took in their own career journey. Ms. Joly shared that her Middle School students meet with her for 40 minutes each day for six week in a classroom that contains tools found in many makerspaces ranging from woodworking tools to 3D printers. 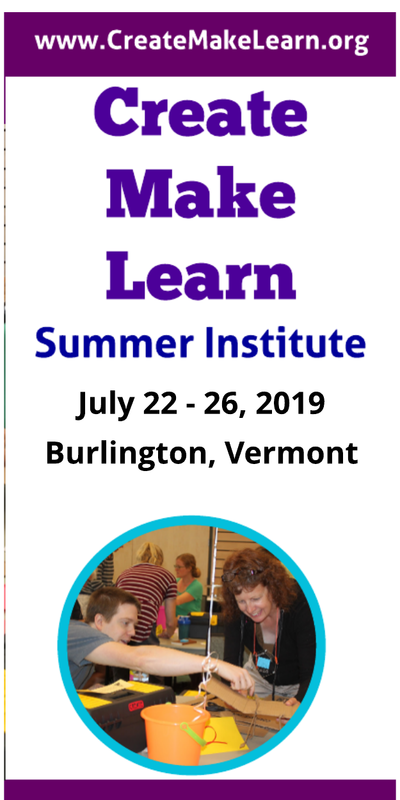 Her program changes each year to introduce the students to a wide variety of skills ranging from design thinking, fabrication, to coding physical objects. to help students understand that there are many ways to solve the same problem---sometimes we use paper and scissors, sometimes a 3-D printer will work best. "By the end of their four years in my program it is my hope that my students will have learned to use many, if not all, of the tools and materials in my classroom. I want them to be able to apply that learning to projects in other curriculum areas as well as real world challenges. ​I feel that my most successful curriculum is that which teaches new skills and introduces new tools and materials that can then be applied​ to a more open ended project. Two important things I need to keep in mind when designing projects are: budget (need materials for ~500 students each school year)​ and time (daily 40 minute classes for six weeks). One other key factor is that we are a 1:1 Chromebook school, so all of our technology related projects need to be accessible with Chromebooks. 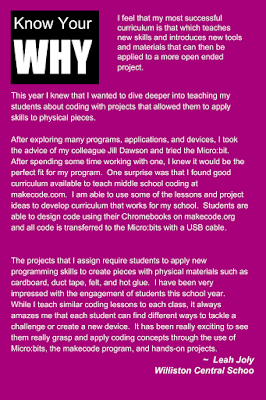 This year I knew that I wanted to dive deeper into teaching my students about coding with projects that allowed them to apply skills to physical pieces. After exploring many programs, applications, and devices, I took the advice of my colleague Jill Dawson and tried the Micro:bit. After spending some time working with one, I knew it would be the perfect fit for my program. One surprise was that I found good curriculum available to teach middle school coding at makecode.com. I am able to use some of the lessons and project ideas to develop curriculum that works for my school. Students are able to design code using their Chromebooks on makecode.org and all code is transferred to the Micro:bits with a USB cable. The projects that I assign require students to apply new programming skills to create pieces with physical materials such as cardboard, duct tape, felt, and hot glue. I have been very impressed with the engagement of students this school year. While I teach similar coding lessons to each class, it always amazes me that each student can find different ways to tackle a challenge or create a new device. It has been really exciting to see them really grasp and apply coding concepts through the use of Micro:bits, the makecode program, and hands-on projects. 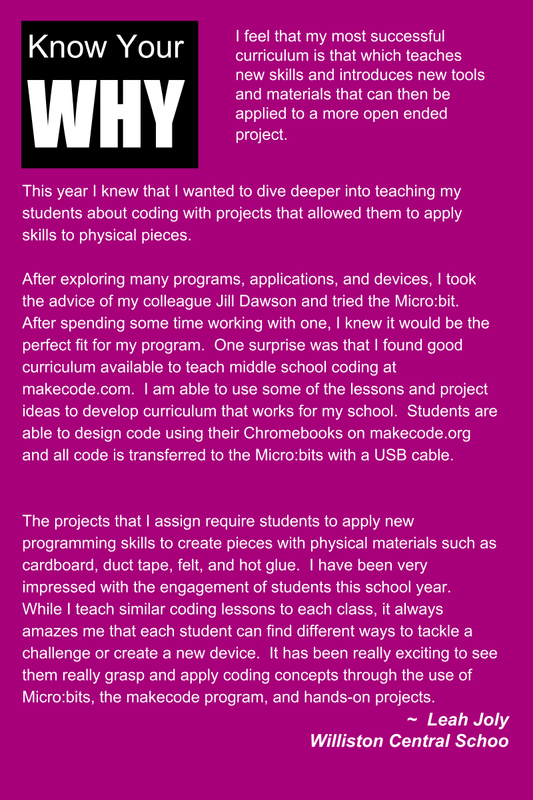 This year I knew that I wanted to dive deeper into teaching my students about coding with projects that allowed them to apply skills to physical pieces. After exploring many programs, applications, and devices, I took the advice of my colleague Jill Dawson and tried the Micro:bit. After spending some time working with one, I knew it would be the perfect fit for my program. 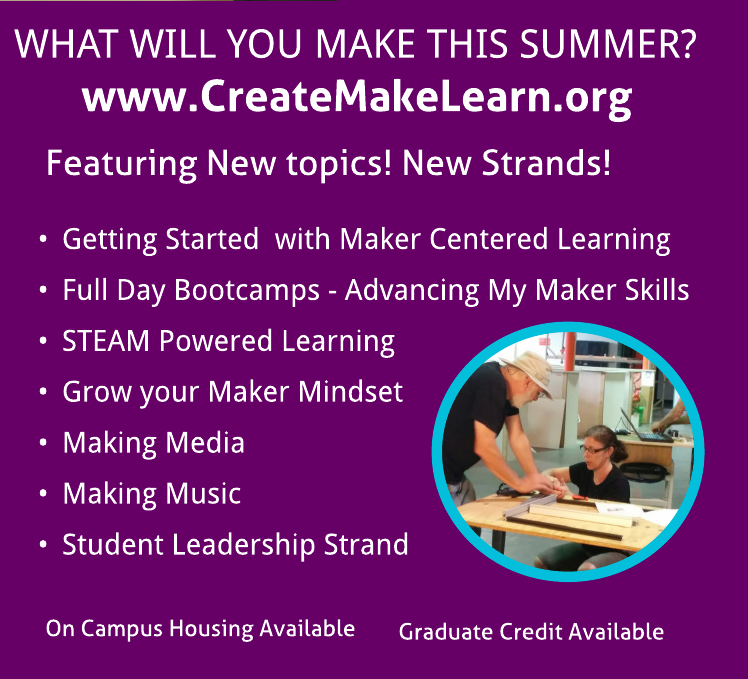 One surprise was that I found good curriculum available to teach middle school coding at makecode.com. I am able to use some of the lessons and project ideas to develop curriculum that works for my school. Students are able to design code using their Chromebooks on makecode.org and all code is transferred to the Micro:bits with a USB cable. The projects that I assign require students to apply new programming skills to create pieces with physical materials such as cardboard, duct tape, felt, and hot glue. I have been very impressed with the engagement of students this school year. While I teach similar coding lessons to each class, it always amazes me that each student can find different ways to tackle a challenge or create a new device. 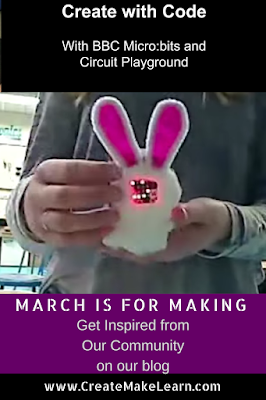 It has been really exciting to see them really grasp and apply coding concepts through the use of Micro:bits, the makecode program, and hands-on projects." We are thankful to the opportunity for students and career professionals to share their learning and their careers each year through the Think About Code guest speaker series held each year during Computer Science Week by Vermont’s Agency of Education, Vita-Learn, and Vermont Google Education Group.